There are three main types of solar energy systems: grid-tied, grid-tied with battery backup (hybrid), and off-grid power systems. To find the right solution for your family, it’s important to assess your need and energy usage habits. If you still have questions after reading the information below, please get in touch and we’ll be happy to walk you through the decision-making process. A grid tied solar power system connects to your home’s electrical panel. And also to the electrical utility grid. Grid tied systems allows the homeowner to use power. From either their home’s solar energy system or the utility grid. When there is a power grid blackout the solar produce power must also stop. The advantage of a grid tied system is the ability to balance rooftop power production. And also supply home power requirements . Producing excess power additionally results in transferring excess to the Power Company (POCOS). Thus lowering your utility bill. When the system is not producing enough power, the home will begin to draw power from the power grid. Grid tied systems are the lowest cost type of residential solar electric system. Since they have fewer required components. Therefore grid-tied systems will not power your home in the event of a power grid blackout. As they shut down for safety reasons. 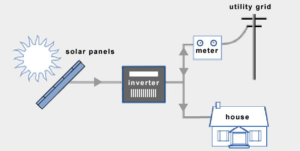 A hybrid grid tied solar power system is connected to the power grid, but also adds battery backup to your system. The addition of a battery backup enables the system to balance production and demand, therefore protects against power outages. Solar electric system production depends on the available sunlight. Moreover when sunlight is abundant, production can exceed demand. Whenever this happens, excess power charges your batteries. Sometimes the system is producing less electricity than demanded by the home, the batteries can make up the shortfall. Grid tied systems being connected to the utility power grid. Allowing the homeowners to draw from the grid during periods of excess demand and to sell power to the grid when there is excess production. A hybrid system allows homeowners on time of day metering to utilize their own power during high demands, thus saving on peak charges. A hybrid system can also be integrated with a standby generator. While hybrid grid tied systems offer more flexibility, they are not without their disadvantages. Charging and discharging batteries reduces the overall efficiency of the system, meaning these systems are more complex and more expensive. An off- grid residential system is completely disconnected from the electric power grid. As a result is an island upon itself. Without a connection to the power grid, batteries are essential. Altogether balancing periods of excess production and excess demand. Backup generators are also common to offset the demand. Eliminating depletion on the batteries during periods of low sunlight conditions. Living with an off-grid solar power system allows greater flexibility. Also allowing peak usage hours throughout the day. Thus greater energy usage all day and low energy nights. Salvaging heat from a running generator. Can also heat buildings or make domestic hot water. There are many options and usage for saving energy living 0ff-grid. Each system offers different benefits offering additional considerations for your family. If you are still unsure which system is right for you, contact us today to discuss your requirements with one of our qualified professional. We can guide you through the process of choosing the solution that best meets your needs, home location in Canada, and even more your budget.